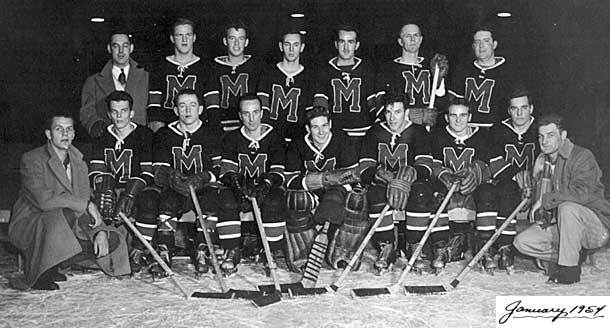 Hi Gary, it appears that a few years ago I made a Big Boo-Boo when dating the Capreol Mohawks as 1951. I actually have 2 different photos of the team and recently when I removed the pictures from their frames I found January 1954 written on the back of both photos. I’ve also checked with former players and others to confirm that it was indeed 1953-54. Sorry about that, I realize it means a bit of work for you, but if you want to change the date in “Looking Back” here are the lineups for the 2 photos. Ray Davies, Joey Hanzel, Jerry Scollard, Lorne Adams, Jim Beatty, Harold Mohns, Stan Martin. 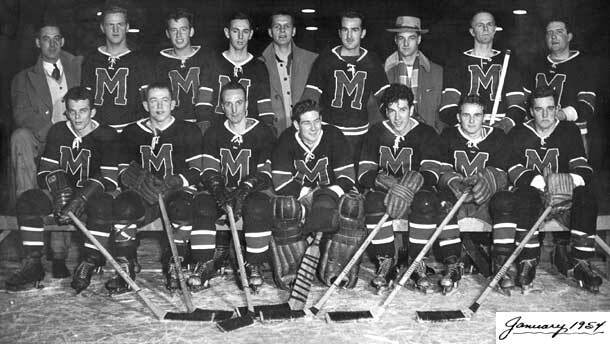 Ray Mohns, Doug Fraser, Norm Giroux, Hank Sprega, Les Laird, Ron Sweezey, Lyall Shane, Doug White, Terry White. Ray Davies, Joey Hanzel, Jerry Scollard, Lorne Adams, Ray Mohns, Jim Beatty, Terry White, Harold Mohns, Stan Martin. Doug Fraser, Norm Giroux, Hank Sprega, Les Laird, Ron Sweezey, Lyall Shane, Doug White. We know it’s time to dispose of the puck. To express our faith in the goodness of man. I trust they will surely approve of our smiles. It’s only in Pro their performance is topped. And give him the credit for doing his share. It’s great to know Jimmy is always on guard. You’d think jet propulsion was pushing him through! The game we call hockey begins to make sense. Fit right into hockey like bugs in a rug. So don’t start a battle with brothers named White! Take off like a Chrysler from Mohns’s garage. A lot of the credit should go to MacKenzie. Who mustn’t be crossed or you’re playing with fire! Of Cayan and Hamlin, so hard to replace. While he ponders the future of prospective Pros. Our boys who are kings on professional thrones. To those who deserve every Hip! Hip! Hooray!